6 Circuit Power Distribution System Self Contained. Easy to install! Comes fully wired and integrated. No assembly required!andnbsp;Two battery cables and 4 holes required for mounting using supplied 1/4-20 hardware. No wiring required, no messing around with switches, relays, fuses and cable routing! Easy access to add your accessories and just a phillips head screwdriver is all that is needed toandnbsp;attach your accessories! 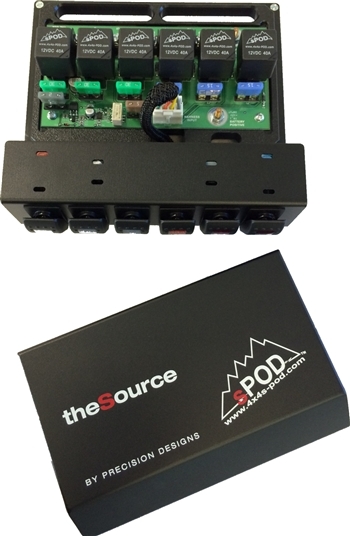 Toss the relay, switch and fuse that comes with the electrical accessory and just attach the positive and negative wires to any of the 6 outputs on our Source, flip a switch and you're done! Integrated LVCO Low-Voltage-Cut-Off circuit that detects the battery voltage and will cut-off at 10.6VDC and cuts-back in at 12.4VDC so there is enough juice to start your vehicle in case you left an accessory on!